A restored church in CoTyrone is on the shortlist for this year’s Construction Excellence Awards. 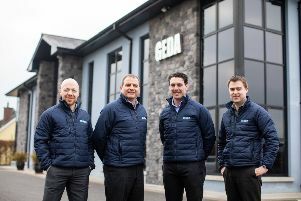 Representatives from across the construction industry in Northern Ireland gathered recently at a special celebration event to showcase the work of shortlisted finalists for this year’s Construction Excellence Awards, among them JPM Contracts for the Sacred Heart Church, Omagh, which is in the Restoration Award category. The 19th edition of the Awards – run by the Construction Employers Federation [CEF] in partnership with SPECIFY magazine – celebrate the best construction, civil engineering and housebuilding projects delivered by Northern Irish companies over the past year. The ‘Showcase of Finalists’ event was held at the Crowne Plaza Belfast and was addressed by Sue Gray, Permanent Secretary at the Department of Finance. There are 13 awards split across five categories with an additional two Judges Special Awards. They are: Overall Award, Achieving Excellence in Partnering Award, Fit-Out Award, Restoration Award, Commercial Construction Award, Social/Community Construction Award, Environmental Sustainability Award, Health & Safety Award, Training Award, Social Housing Award, Private Housing Award, Transport and Utilities Infrastructure Award, Health Infrastructure Award, Education Infrastructure Award and, GB & Republic of Ireland Construction Award. The winners will be revealed at a gala dinner in the Culloden Hotel on October 18.